Most of Russian people are Orthodox Christians. They upheld the religion that came to their homeland more than a thousand years ago. However, many Russians regard their Christianity as a symbol. No religion is so widespread in Russia other than Orthodox Christianity. Almost all communities, large or small, have their own Orthodox Church. How do people of Russia celebrate Easter? The Easter celebration is always preceded by 40 days of Lent. That period is also called the miserable weeks. Christians fast for 40 days before Easter. This time to recall and reflect on the meaning of Christ’s suffering to death on the cross for our sins. In this period of reflection, it is worth examining personal, family and community life. Only with awareness of sin and relying on God’s grace that leads to repentance and a determination to renew our lives can and deserve to welcome and celebrate the Easter. After seven weeks of Lent, at Easter table will usually be filled with a variety of meat-based dishes. Easter eggs worth billions were made in 1885 on the orders of Tsar Alexander III. The royal jewelry craftsman is Peter Carl Fabergé. The Easter egg intends to serve as a present for Czarina Maria Fedorovna’s wife for their wedding anniversary. Peter Carl Fabergé also execute the leader’s orders immediately. Fabergé and his men worked in secret places for several months to create each egg. Even Tsar himself does not know what kind of eggs will be made by Fabergé. Each design is made to represent every important event happening in the royal family. These eggs are made with gold and decorated by diamonds, emeralds, ruby ​​and other precious stones. One of the most expensive was made in 1913 at a cost of around Rp44 billion. In Easter Day, you will be given a variety of typical dishes of Easter, one of them Kulich. Kulich is a bread which is a cross between cake and bread with a crunchy texture. Derived from the Greek, Kollix which means bread board. The top layer is called karona or crown. Because usually the part will be sprinkled with toppings, such as powdered sugar that is allowed to dry on the sides of the cake. If you notice the layer resembles the crown of thorns of Jesus Christ. Usually kulich served with Easter eggs along with other typical food. Kulich is cylindrical. Made from flour, sugar, milk, yeast, and raisins, as well as other complementary. The process of making kulich is an important for Russian women. If kulich expands high and good, it means that the life of the producer family will be in blessing. But if not, then there will be a disaster. 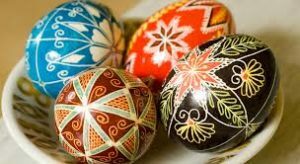 The game of rolling eggs appeared in the XIX century and has long been a tradition in Russia and Germany. The game tradition of rolling eggs is also adopted by the US, the White House annually holds a game of rolling eggs in its yard. In Russia, this tradition is popularized. Now many stores are back selling special skates to topple the eggs (the rule of this game is that you are required to compete rapidly rolling eggs to touch the prizes available at the end of the path). The game ‘egg duel’ is also often held, where you can attack other eggs, to see whose eggs are cracked. Easter celebration on Sunday. On the day of the Resurrection of Christ, the cry of victory “Christ has risen.” Then was greeted loudly by the people with the cry of “True has risen”. Sunday morning there is no worship because it was celebrated on the eve of the morning yesterday. Rabbits are a symbol of fertility and new life. Why so? Because rabbits are known as animals that have many children. Similar to Santa Claus, the Easter Bunny becomes a popular character for children.